SHARING A CENTRAL COURTYARD, THE LINEAR, GRASS-ROOFED ART GALLERY AND THE THEATRE BUILDING (WHICH HOUSES A 400 SEAT AUDITORIUM, MUSIC AND DANCE REHEARSAL ROOMS) COMPRISE THE CENTRE, A HUB OF ART PRODUCTION. A GENTLY TERRACED, GRASS EMBANKMENT CREATES A BACKDROP TO THE COMPLEX AND ATTRACTS DAYTIME USE BY STUDENTS. AT NIGHT, VISITORS SPILL OUT OF THE VOLUMINOUS THEATRE LOBBY INTO THE COURTYARD, WHICH IS WELL USED AS A FUNCTION SPACE IN THE SUMMER MONTHS. 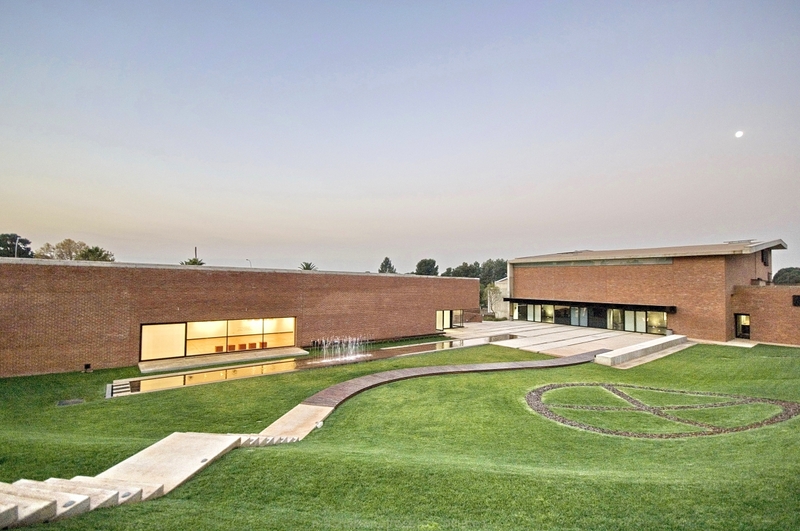 A LINEAR CONTEMPLATION POND AND FOUNTAIN BY ARTIST MARCO CIANFINELLI COMPLIMENTS THE GALLERY AND REINFORCES THE IDEA OF EXPERIENCING THE ART BOTH INSIDE AND OUTSIDE. THE USE OF OFF-SHUTTER CONCRETE AND RED FACE BRICK IS A SIMPLE AND DIRECT REFERENCE TO THE MATERIALS USED THROUGHOUT THE REST OF THE CAMPUS. THE PATHWAY THAT SLICES THROUGH THE SOFT LANDSCAPING TO THE ARRIVAL COURT IS ON AXIS WITH THE ENTRANCE TO THE MAIN UNIVERSITY BUILDING. LARGE WINDOW BOXES ALLOW VIEWS OUT OF THE DANCE STUDIOS BY DAY. AT NIGHT THE GLOWING INTERIORS ALLOW PASSING TRAFFIC GLIMPSES OF THE PRACTICING DANCERS.